In front of 75,000 paying customers at a packed Old Trafford on Sunday afternoon, Manchester United will parade up to £149m worth of new talent as they take on QPR in the biggest league in the world. Behind glass screens high in the cavernous stands some will sip champagne as a galaxy of expensive stars including Angel Di Maria, Radamel Falcao and Marcos Rojo are introduced to the home support for the first time. Millions will watch around the globe. Around the pitch advertisement boards will promote multi-national companies, many of whom will have paid handsomely for the privilege. Fifteen miles to the east, another team called United and representing Manchester will be kicking off the second half of their first match on the long road to Wembley. Like those at Old Trafford, they will wear red shirts, white shorts and black socks. However, in the slightly more compact surroundings of Stalybridge Celtic's Bower Fold ground (capacity 6,500) there will be no millionaire superstars and no private boxes, although sponsors can watch with everyone else from the comfort of the clubhouse. Merseyside outfit Prescot Cables, named so because of a nearby cable company, will provide the opposition in front of a crowd of around 1,400 in a match held on Sunday not because of TV demands but because the landlords are at home on Saturday. Those in action will be on an average of £150-a-week and have jobs of their own. Fans will be able to stand on a terrace and mix with the players in the bar after the final whistle. The atmosphere is incredible. I could take my grandmother - it's what football should be like. Welcome to the world of FC United of Manchester. 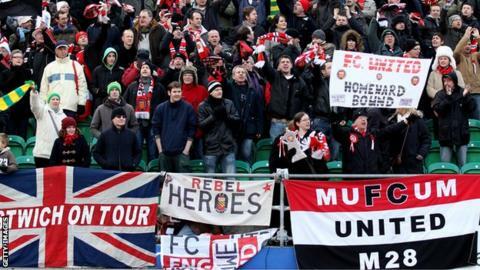 The rebel club, set up in protest at the Glazer family's debt-burdening ownership of United, will be 10 years old next year. In November, they will end almost a decade on the road by coming home to a new 5,000 capacity stadium in Moston, a working class urban suburb in north east Manchester. These are exciting times and yet, according to general manager Andy Walsh, it could have been different had a 2005 phone call to Sir Alex Ferguson shortly before the American family's controversial takeover prompted a different response. Walsh said: "We had it on good authority from our friends in the city that the banks who were lending the Glazers the money to buy the club would have pulled out had they not had the continuity of Sir Alex and (chief executive) David Gill in control of the club. "I was a member of the independent supporters' association at the time and would speak to Sir Alex from time to time. If players do not fit the attitude of this club they do not cross the line. "It was decided that I should call him and ask him to resign. It wasn't an easy conversation and ultimate respect to him for speaking to me. He listened to what I had to say but said that he did not want to jeopardise the livelihoods of all the staff he had brought to Old Trafford. "It was a high-risk strategy and, although it seems ridiculous now, we were close to getting a deal on the table that would have given supporters ownership of the club. Sir Alex would have been carried back into Old Trafford on the shoulders of those supporters." As a result FC United was born, following an emotional meeting at Manchester's Apollo Theatre in which 1,000 signatures of support were taken. Life began in the North West Counties League Division Two - level 10 of the football pyramid. "We had to persuade the league we would see out the first season," said Andy. "We asked people to donate cash - we got £180,000 and they were happy with that." The oiks off the terrace have a voice. We are pieces of a jigsaw that don't fit in anyone else's puzzle. The club is a co-operative. It is based on the theory that every member is of equal value. Each has a vote on all issues apart from football matters which are left to the elected board. It is a democratic system affectionately referred to as "Punk Football". "That was coined by fans," said Andy. "Punk music was about music fans doing it for themselves and not bowing to the man. Laying down your own tracks, putting on your own gigs in the back of a pub. "It's appropriate for our club in that FC United is about fans creating a club for fans, raising money ourselves, putting a team together ourselves." A deal was struck to play home matches at Bury's Gigg Lane and a successful first campaign saw them crowned champions in front of 6,032, a league record which will in all probability never be broken. Successive promotions followed to take them to the Evo-Stik Northern Premier League Premier Division where they have remained for six years. For four years in a row fans (average attendances have stabilised at around the 2,000 mark) have suffered the heartbreak of play-off defeat. However, it is hoped the move to Broadhurst Park (the name chosen by supporters after a poll) can finally take them to the Conference North and eventually the Football League. I love the democracy element. I am an owner of the club and I have a say in every decision. The facility itself is a testament to fan ownership. Of the £6m it cost to build, almost half was raised by supporters with £2m coming from an innovative community share scheme which has been used by other fan-owned clubs including Portsmouth and Wrexham and a charity aimed at restoring Hastings Pier. In summer, supporters answered a call to come and clear the ground of stones so the playing surface could be laid. A local amateur team, Moston Juniors, will play on one of four pitches at the site. A medical room, classrooms and a function room will be opened to the community. One of the stands, a 23-step covered terrace, is being brought in from the Drill Field, the former home of Northwich Victoria which was believed to be the oldest ground in the world on which football had been continuously played. Supporters will enjoy cask ales after a deal was signed with Manchester brewers Joseph Holt. Nearby restaurants will be encouraged to set up stalls behind one of the stands. Currently discussions are ongoing with a Lancashire bakery to provide the pies. Prawn sandwiches will not be on the menu. First things first. Starting with Prescot, five victories would put FC in the hat for the FA Cup Third Round along with United. It is an unlikely scenario and one that is not relished. "That would be very difficult for all of us," said Andy. "It's a prospect we'll face if it comes." Much has been made of United's splurge in this summer's transfer window and whether FC would still be relevant if the Glazer family sold the club. "Regardless of the ownership at United, FC will continue," said Andy. "People enjoy the fact they are owners and have a direct influence. "Already we have had an impact. Other clubs have followed our lead and introduced pay-what-you-can-afford season tickets. Man City have a fan engagement officer. "Our goal is not just to change football in Manchester - it's about changing football more widely than that. "There is still work to be done."